"A fantastic opportunity has presented itself that Plastic Imagination simply could not refuse regarding the Rise of The Beasts line. This opportunity allows them to bring the line to market without asking the fans to make a pledge in advance and allows them far greater flexibility regarding the frequency of new characters being released. They are ecstatic about this opportunity and believe the fans will be as well." Well, this is a sweet twist of events isn't it? The first figure (the Gold Lion) will be here in June, way sooner than expected! Keep yourself updated following the thread at LittleRubberGuys. $11,000 goal reached, the project is funded! But there's more: we break through the $14,000 wall too! That means that every person who pledged $45 or higher will receive a FREE series 2 figure along with the bonus GOLD lion figure. Let's keep the momentum up, we have 3 days left, if we can reach $17,000 a second series 2 figure will be included for the $45 pledgers, and the bonus GOLD lion will be available for the $30 level too! That's true, following the HUGE success that graced the great OMFG toys, another collectible-friendly toyline comes out of the shadows, by the guys at Plastic Imagination, named Rise of the Beasts. 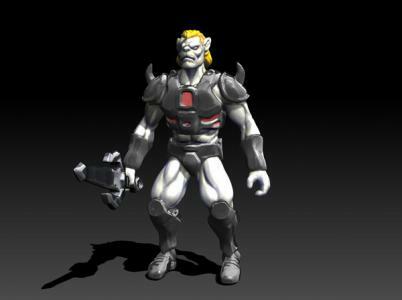 It's a clear homage to the 80's properties like MUSCLE, Battle Beasts, Thundercats and Masters of the Universe all mixed together to bring you a product with tons of potential. Rise of the Beasts is a new collectible offering in the spirit of classic 80's toylines like M.U.S.C.L.E., Battle Beasts, He-Man and Thundercats! Savage Beasts that radiate power combine with ancient technology long lost to modern man. Whether you are a fan of mini-monos or small painted, articulated figures, you will LOVE these figures! Series 1 consists of 4 figures - A Lion, a Gorilla, a Horned Toad and a Komodo Dragon. 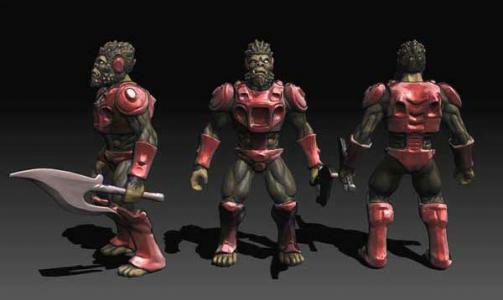 The first 3 beast's heroic body styles were partially inspired by classic toy lines like Thundercats, Sectaurs and Masters of the Universe. The 4th is suggestive of the fantastic Battle Beasts line with its squat, muscular proportions. 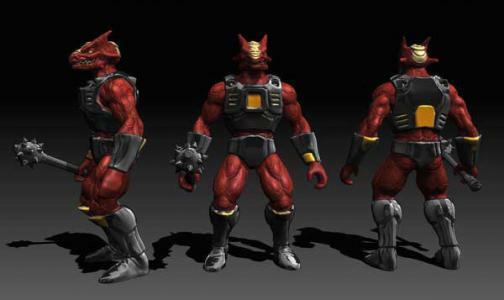 Series 1 will be made of PVC (like M.U.S.C.L.E.s, Battle Beasts, etc. ), approximately 60mm tall, available in both painted and non-painted formats, with a weapon and joints at the shoulders. Here are a few images showing the figures. The Lion will be cast in white PVC. For the painted version, the armor will be charcoal gray with red highlights. His hair will, of course, be yellow. The Gorilla will be cast in black PVC. For the painted version, the armor will be red with black highlights. The Horned Toad will be cast in red PVC. For the painted version, the armor will be black with yellowish highlights. The shorter Komodo Dragon will be cast in a dark green PVC. For the painted version, the armor will be bronze. Isn't it wonderful? The figures' articulation points will vary from 3 points, neck and shoulders, to 1, the neck, depending on the sculpt. If you like it please consider to become a baker for this project, the goal is to raise $11,000 by Wednesday March 14 and right now we're almost halfway!